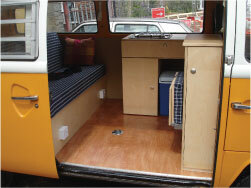 We build our own range of Interiors for VW campers. Either choose from one of our tried and tested layouts or we can custom design and build one to your specification. 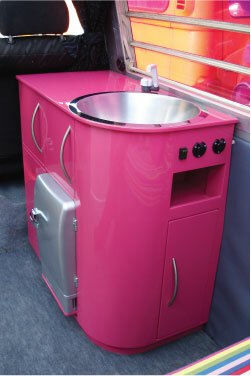 We offer furniture in a wide range of materials to suit you and your camper. 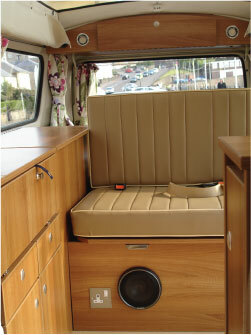 We can convert a bare van to a fully equiped camper, fit an extra seat with safety belts, rebuild, improve or just repair or adapt an existing conversion. 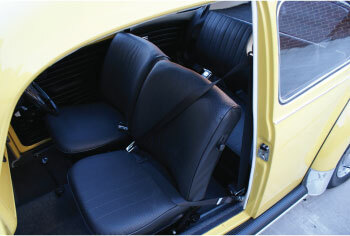 We offer a full upholstery service for all classic Volkswagens. Restore & re-upholster seats to original standard. 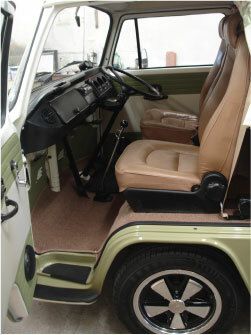 Side & door panels- original spec or custom. 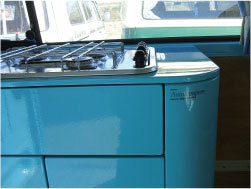 Gas Appliances - Cookers, pipework, regulators, fridges. Water systems - Tanks, taps, pumps, pipes, fillers, cleaning. 12V electrical - Split charging systems, 12V sockets, wiring looms, fuse boards, charging systems, leisure batteries, lights and solar charging panels. 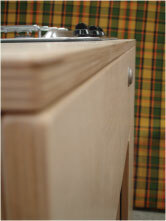 Audio systems - Radios, speakers, amplifiers, period style radios, discreet/custom. Heaters - Gas blown air heating systems, 12v de-misters.